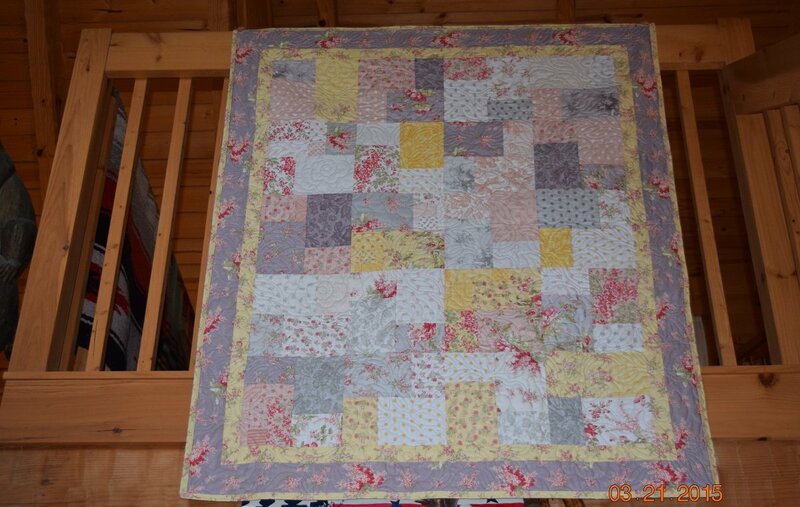 Beautiful days are ahead and how perfect would this spring quilt look lovingly draped across you quilt rack? Imagine it hanging beautifully against a baby crib or wrapped around a sweet baby girl.... The colors in this classic pattern absolutely sing spring! With pastel yellows, purples, pinks and white. All fabric is 100% MODA quilting cotton from the Whitewashed Collection. Batting is warm and Natural, only the finest to keep you or your child warm during those cold brisk nights. A mother to be is sure to love this quilt in any room of her home. You can bet she will think of you every time she sees it as it lightens her mood and days too! Quilt is completely handmade. Machine pieced, quilted and bound, this gorgeous keepsake is made to be well loved for generations to come. It is quilted with a "Just Roses" pattern that creates the softest and most sought after "crinkle texture" of a true quilt. Backing is from the same line, Whitewashed Cottage. Quilt measures approx. 45"x 54" - a great size to leave sitting on the couch without taking up too much space, but also generous enough to wrap your child up with love! A great size to grow with baby or as a crib quilt as well.